Well our week in Iowa screamed by in a fantastic blur of time with friends and family. We rolled into Solon on Friday evening and partied/climbed with Joe and fam, during which I jammed the crap out of my ring finger. A week+ later it is still swollen and sore. Saturday found us scarfing down finger food in Washington with the Asbury/Patrick/Reid crew, which was the start of our 2 day "Thanksmas" celebration. On Sunday we moved the party down to Mount Pleasant and collectively devoured 6 feet of Subway sandwiches. Monday we crashed a potluck at our old lab and then partied/climbed/rolled sushi into the wee hours back in Solon with the Tuesday Night Bouldering crew. Tuesday we cruised down to Burlington, hooked up with Mikes family and destroyed some Mexican food. Wednesday we helped Mike finish up some last minute Christmas shopping and then made our way over to Molly's parents house. 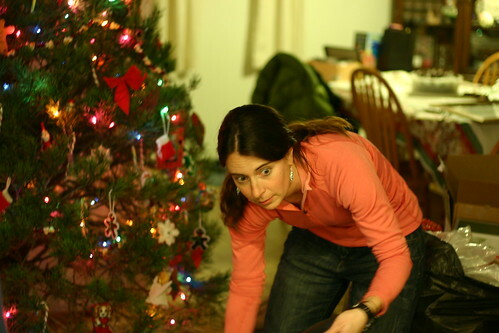 Thursday was a flurry of wrapping paper, Amana ham, and way too many frosted cookies. Friday we met several old friends down at Mr Motos for breakfast and coffee. After a quick visit to El Taco Casa we landed back at Mikes house to watch the boys play Rock Star. Then Saturday we did the long drive home. Whew!! As usual I did a horrible job of documenting the trip with photos. We did get a great new lens for our camera so I did manage to snap a few shots on Thursday. 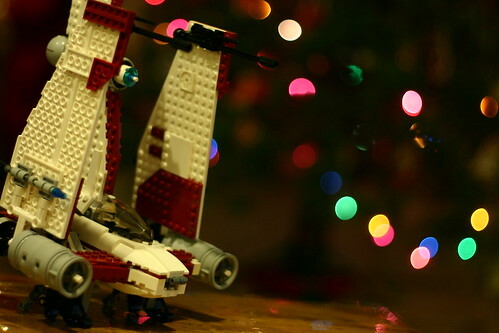 For all you camera geeks out there, these were shot with a fixed 50mm lens with an aperture of 1.8. 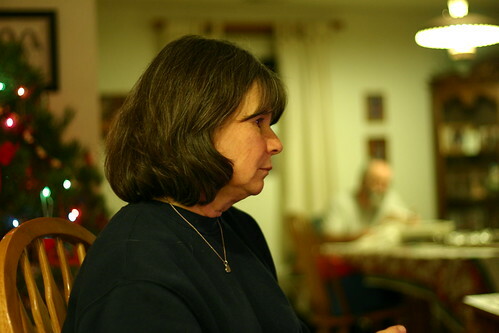 This is a great lens for shooting people because it has such a shallow depth of field which really makes your subject pop from the background. Also, the wide aperture allows for shooting inside without a flash. Here are a few shots. Yes!! The ski season has arrived!! Oh JOY! 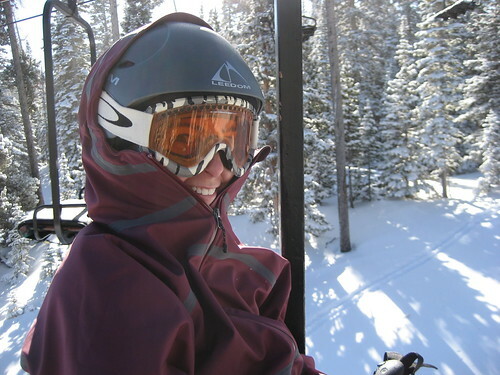 As a teen I was heavily influenced by Warren Miller's movies and have yearned to live the dream life of a ski bum. I still remember when the movie Aspen Extreme came out. What could be cooler than living out of a van and skiing all day. 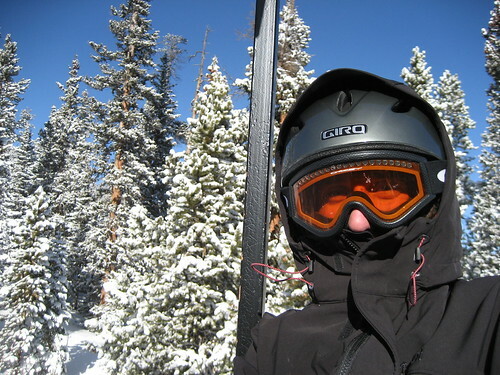 Well, I haven't quit my job so I don't think I actually qualify as a ski bum yet. 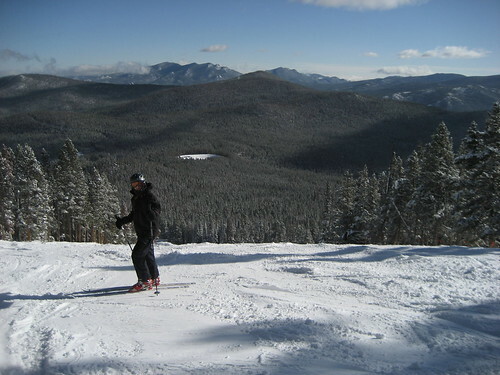 But I do have something that is nearly as good, a season pass to Eldora Mountain. So the mountain officially opened on the Friday before Thanksgiving but it has been a little hectic to make it down there until last Tuesday. After a night of sleep reminiscent of an eight year old before before Christmas we packed a lunch and headed out. I should also mention that this would be our first day back on skis. Molly and I both switched to a snowboard about 10 years ago but we want to eventually get out into the backcountry, which is tough on a snowboard. So, after much reading and carefully watching eBay we both arrive at the mountain with a new (well, used but new to us) Telemark ski setup. Here we are getting set up in the parking lot. We had spent the previous night watching internet movies on how to tele ski and thought we might have a chance of surviving our first run. However, upon closer inspection of the map, we discovered that the only lift that seems to be running only services blue and black runs. What? No green runs? I should note that only about 30% of the runs were open because it is so early in the season. Here is Molly contemplating the bruises she is about to recieve. Well, there wasn't much we could do about it so we hopped on the lift and away we went. 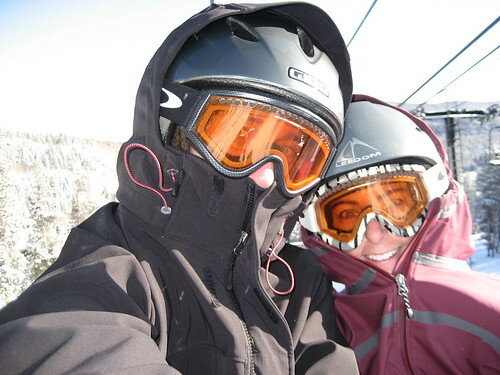 Here are some shot of us on the lift. Wow, those pics make it look cold! The weather was actually perfect. Temps were about 18 degrees, which sound cold (and is when you are on the lift) but it make for light snow and I always get really hot when I ski, espceially when I don't know what I am doing. 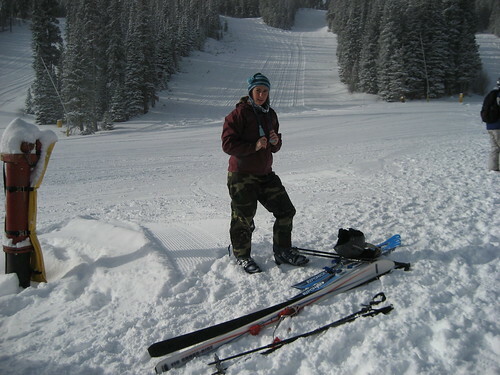 Tele skiing is a little different than alpine skiing because you heel is not fixed to the ski. This requires a different technique for making turns. It is supposed to look kind of like a lunge with both knees bent and you uphill foot slid back so that you are on the ball of your foot. I would include a picture but neither of us were able to do it! It looks so easy on the internet! Oh well, we have a whole season to work on it. Here are some shots on the mountain. Well after about 4 runs our legs were shaking and beat from all the "lunging" and crashing. 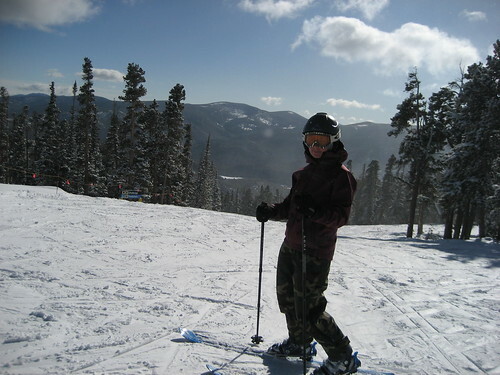 At one point I shot off the edge of the run into the trees and got buried in the soft snow. I had to get out of my skis to get back to the run. Anyhow, it was a great day. 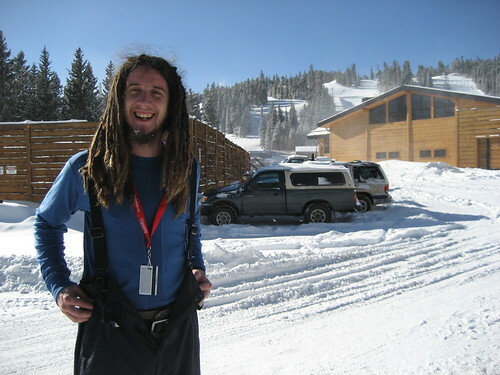 Here is a shot of me on my fist day as a part-time ski bum. Note the joy in the eyes and snow in the beard. Good times! Recently, I have been trying out a somewhat new climbing technique called Solo Top Roping. This essentially allows me to go out on my own and safely climb some routes. 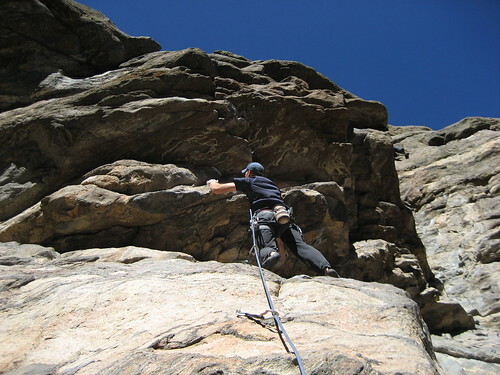 This is differnet that my usual "style" of climbing because I do not have a partner with me. Anyhow, I close friend of mine does this quite a bit so he was able to get me going on it. However, when searching my usual climbing resources, I found it difficult to find any information so I decided to post my method. Standard disclaimer: this is a somewhat advanced technique. If you are not comfortable with jugging, rappelling, and transitioning between the two, you should probably get those down first. 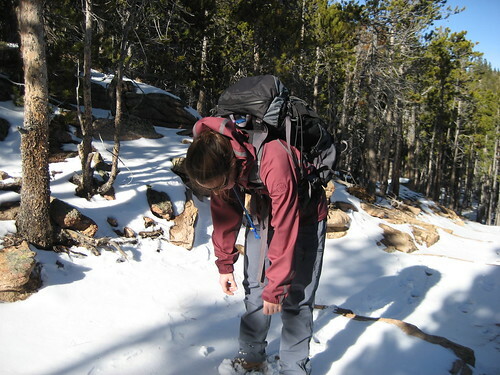 Also, remember that you are on your own so if you forget something in your pack, you may be stuck! 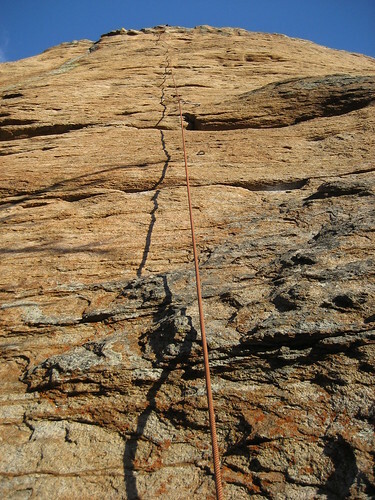 Step one is to get to the top of a route and rig up a bomber anchor. The usual rules apply (redundant, equalized, non-extending, etc). Here you can see my 3 bolt anchor with a cordalette. Then you attach your rope with a figure 8 and a couple biners. I typically use at least one locker. Also, pad any edges the rope will pass over. 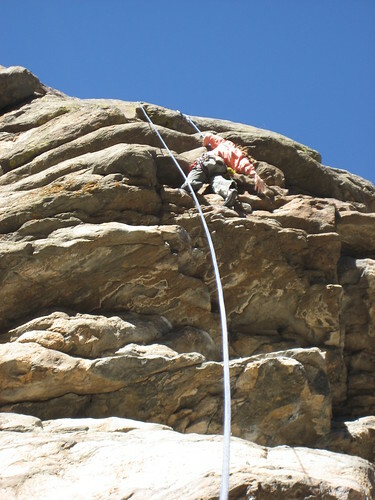 This is important because the rope is not moving so the same spot will rub on the rock as you weight and unweight the rope. Depending on the route, you may want to rap the route and clip the draws. This is nice if the route wanders or is overhanging. Here is what it looks like from the bottom. 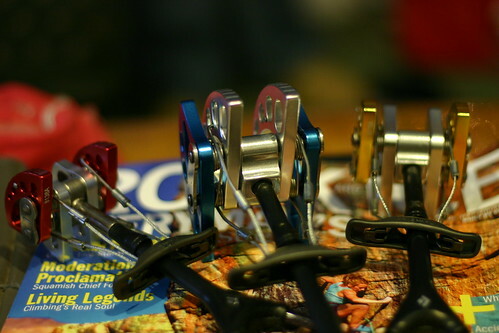 Now you can start rigging yourself up. First make sure you have everything you need because it is a pain to get more stuff after you are hooked up. I attach my backup first. 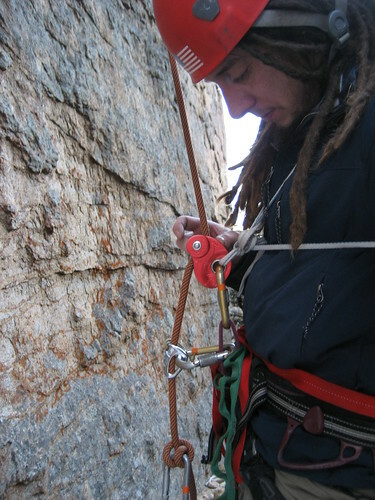 I use a Tiblock clipped straight into my belay loop. NOTE! It should be pointed out that I rigged my Tiblock backwards! Yikes! The rope should be on the inside of the biner. Next, I add a Mini-Traxion above the Tibloc, again clipped directly to my belay loop. Then I make a chest harness from a double sling and tie the Mini-T to it. This keeps the Mini-T high, reducing the distance of the fall to almost nothing. This also keeps the locker from being accidently crossloaded. 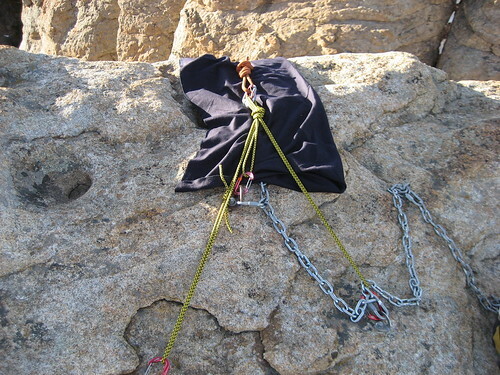 Finally I add some wight to the rope by tying a water bottle or my pack to the bottom of the rope. 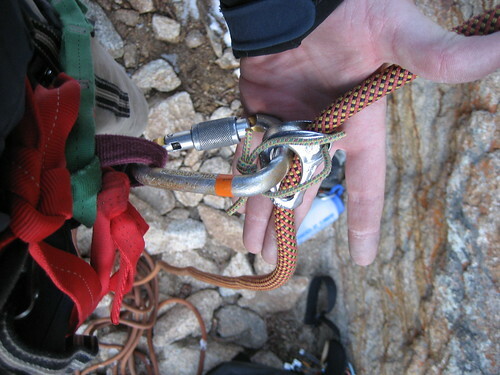 So, as I climb up, the rope slips through both the Mini-T and the Tibloc but if I fall or need to take a break, the Mini-T clamps onto the rope. In other words, both of them will easily slide up the rope but not down the rope. 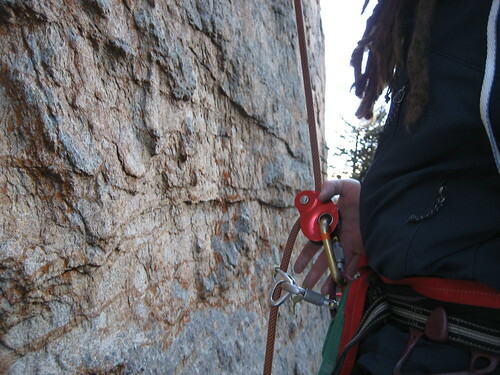 Some people are skeptical of self belay with a Mini-T because of teeth on the cam. There is talk of it shearing off the sheath of the rope if you take a whipper on it. If I were using this to solo lead climb, I may find that to be concerning but I only use this on a TR setup that is slabby to slightly overhanging. The falls I take are never substantial and I would not use this on anything that could possible generate anything close to a whipper. My falls are usually in the 2-3" range, which is mostly from rope stretch after the Mini-T has engaged. I do slightly worry about cross loading my backup Tibloc and next time I see one of those lockers with the plastic crossbar, I will snag it. However, even if my Mini-T fails and I do end up on my backup, the fall will be small (maybe 6 inches). That being said, I do keep an close eye on it when I am climbing. Well, it has been a little while since I added to my blog and consequently I am a little behind. About a week ago, Molly and I gave Estes Cone another shot. The weather had been cold and cloudy for about four days and we needed to get out. The forecast for last Saturday called for low wind and mostly sunny skies. Perfect! 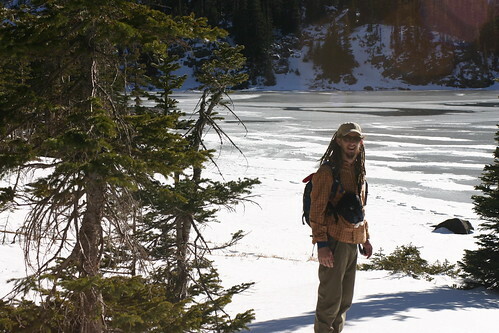 So we packed the bags and headed out to the Lily Lake TH. 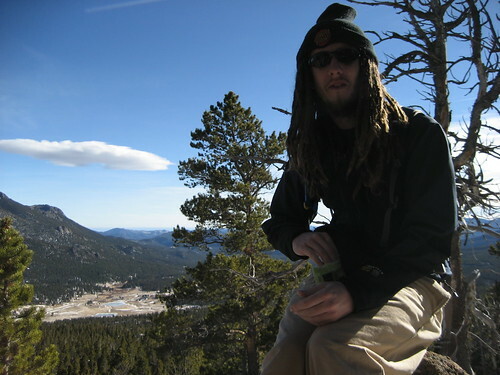 As you may remember from a previous post, the summit of Estes Cone is about 4 miles from the Lily Lake TH. We had started this hike before but ran out of time. This time we hit the trail at about 11 am, so we had plenty of time. The temps were in the low 30's, so it was a little crisp if you sat around too long. Here is Molly pointing out our destination. The Storm Pass trail branches off the Lily Lake trail soon after leaving the parking lot. Immediately we noticed that no one had been on this trail lately because there were no tracks in the snow, which was about 2" deep and unconsolidated. Here is Molly as we started in to the trees. 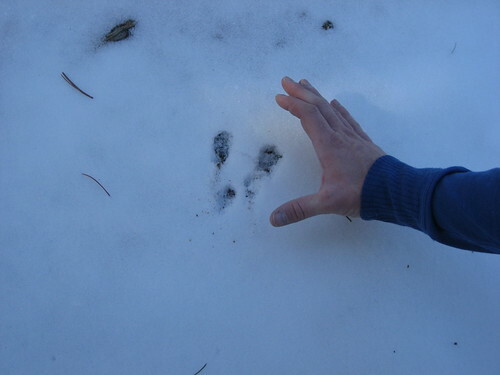 Initially we were concerned that it would be hard to follow the trail but it was actually quite obvious. 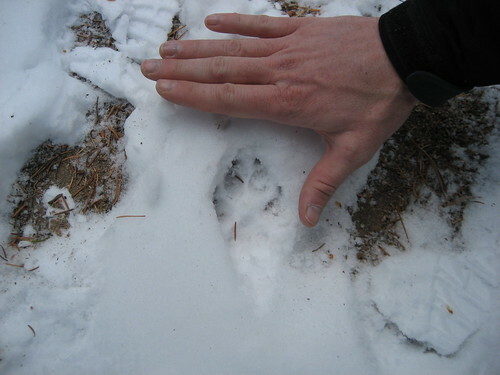 It helped that the majority of the trail passed through a dense evergreen forest. Along the way we got to take a guess at various tracks in the snow. Here are a few of the highlights. 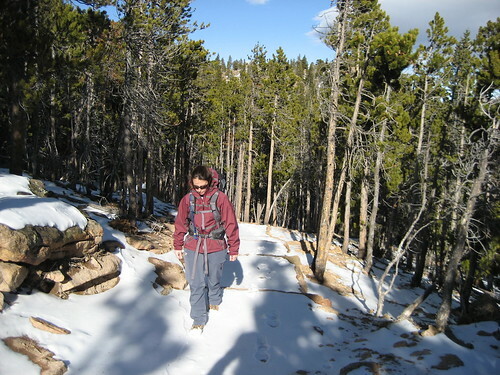 I think both of us were surprised at how difficult the snow made the hike, at least on the way up. It was kind of like walking in sand. Here is Molly feeling the climb. We stopped for a bit to much on some Kind bars and pistachios. It is hard to beat pistachios on a hike. 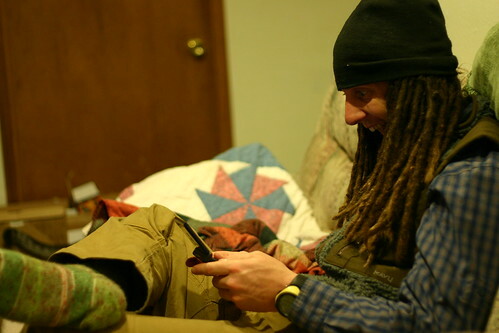 Here is Molly laughing at another one of my hilarious jokes. Along the way we saw something pretty cool but hard to describe and impossible to take a picture of. There were these somewhat small puffy clouds that seemed to have a rainbow overlaid on top of them. They were beautiful. It reminded me of one of those trippy Grateful Dead posters. Maybe someone laced my pistachios with acid. Sounds like something Molly would do. After about 3 hours we reached the trail junction where the summit trail branches off of Storm Pass trail. 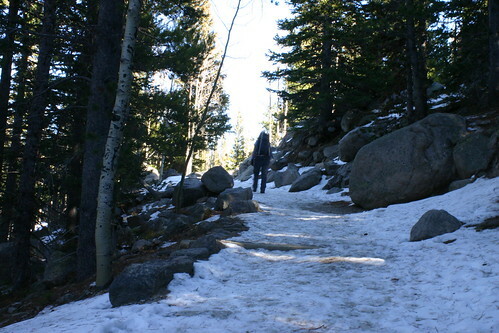 Up until now, the trail had been pretty easy to follow, even with the snow. Unfortunately, right after the junction it became very difficult to follow and we quickly lost it. Getting to the summit would not of been a problem because we were only about a third of a mile away but we both became concerned that we may not be able to find the trail on the way back down. After a short discussion we agreed that losing the trail in the winter was not a good idea so we turned our backs to the summit and headed down. Kind of a bummer but it was a wise decision and a storm was brewing over Longs peak. We were both sure that we could of made it but it just felt a little risky. I think I'll start carrying my GPS during the winter. The walk back to the car went fast. 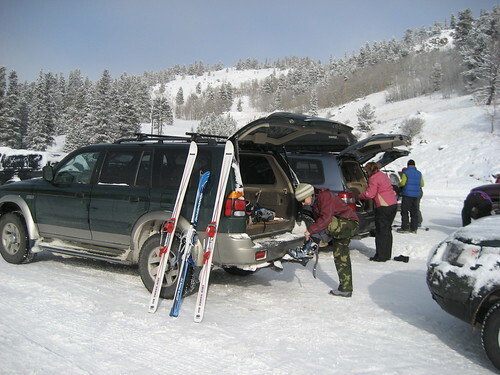 We both longed for our skis but the thin snowpack would of destroyed them. While the hike up took 3 hours, the hike out only took about 1. Here I am excited to be nearing the parking lot because were heading Eds Cantina for some burgers and fries. All in all, it was a very nice hike. It feels good to be able to get out in the mountains in the winter. Here are some random shots from the hike. Well, it has been a while since I had a good rant so I think it is time to warm up my fingers and get on my soap box. Today’s topic is a movie I watched last night called Expelled: No Intelligence Allowed. This is a film by Ben Stein where he looks into the whole Intelligent Design (ID) vs. Evolution (or Evilution according to Summit doctrine) thing. Here is my take on it. But first a small disclaimer! The film presents an argument that Intelligent Design is not getting its fair shake in the scientific world of research. And who is behind all this? The “Darwinian Establishment” of course (I think they meet on Tuesdays at the VFW). It supports the argument with a few interviews with people who bucked the system and then mysteriously lost their jobs. Unfortunately, the film then jumps the tracks, loses sight of it’s thesis and spends the rest of the movie attempting to discredit evolution, strays into the murky “how did it all start” discussion, and finally makes the spectacular suggestion that Hitler wouldn’t of been so bad if he didn’t believe in evolution (it was a “necessary condition”). Magicians have a saying “the big move hides the small move”. That is what I feel happened in this movie. What needs to be shown is that ID is a valid science. Discrediting evolution does not make ID a valid science. Neither does pointing out that evolution doesn’t explain how it all started. And the whole Nazi thing! Crimey! What was the purpose of that? Surely they were not suggesting we should ignore all the benefits we enjoy from the theory of evolution (your flu shot for instance) and cut out evolution research or teaching because the Nazis used it as an excuse. Isn’t that what they are claiming is happening to ID, except of course that evolution has already been proven to be a useful science, especially in studying viruses and bacteria. 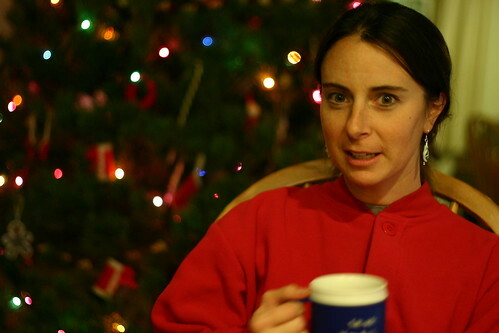 10 years ago, my (soon to be) advisor at the U of I was a lowly assistant professor with very little grant money (maybe even none at all). He had a hypothesis about human movement and with the help of his PhD student, got a rough model up and running, collected data, did the analysis, drove himself 10 hours to a conference in Detroit and presented it to the current leaders in the field. It was not well received because it flew directly into the face of the current establishment. What it did lead to was a heated “discussion” in the hallway that nearly ended in fisticuffs. However his data was good, his methodology was solid and people knew it. Fast forward and he now runs a research center of 100+ people, is tenured, was recently recognized as bringing in more grand money to the College of Engineering than any other faculty member, and is considered a significant figure in his field. This is how science works. So if there is no man to hold them down, why is ID not taken seriously in the scientific community? The answer is somewhat boring. It lacks a conspiracy theory or an underdog. It is simply that there has been nothing presented to take seriously. You can safely bet your retirement money that if there was a solid idea out there that over threw the usefulness of evolution, whoever cooked it up would quickly be rich and famous. Well, maybe not rich. We are talking about academia, after all. But what about the people that lost their jobs? Remember what that guy in the movie said about “beware of one hand clapping”? 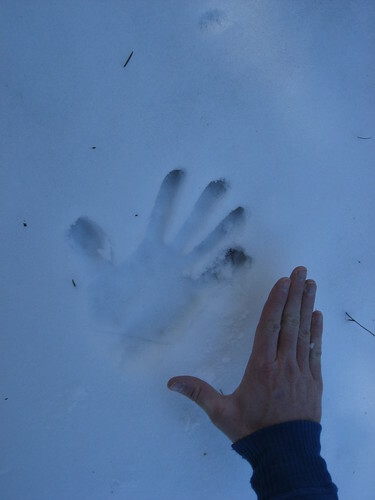 A quick search on the internet and you will find the other hand. If the ID crew wants to be taken seriously then they need to man up and take responsibility for being accepted. This is not going to be accomplished with lawsuits, Hitler claims, or expensive lobbyists. They need to dig in and do the work. Gather data, perform tests, and do all the stuff that scientist get paid to do. If there really is something there, people will notice. Anybody can come up with a hypothesis but the onus is on them to prove it. Until then, it’s a personal belief, not science. A Week Long Turkey Celebration! Well we just finished a week long party with Molly's family. Unfortunately, I did a poor job of taking photos. Hopefully some people will post them. 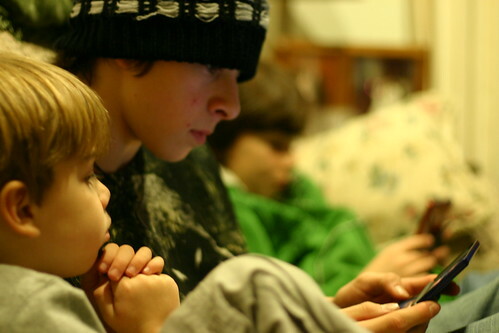 Then I will swipe their photos and add them to my blog. The festivities started on Monday afternoon when Molly's parent arrived after setting a land speed record for moseying across the Midwest of 1.5 days! They were sporting a fancy new silver Toyota Corolla and a 21 pound turkey, frozen solid. Not to mention various gifts of chocolate, jalapeno/cilantro mustard, Jeff Foxworthy jerky, Sterzings (!!) and my personal favorite, snowman Peeps. We celebrated their arrival with some delicious burgers/taco salads at Ed's Cantina. Tuesday was a workday for the men and a shopping day for the ladies. The project started out as a simple rewiring job for the office. The house was wired such that the fridge, microwave, toaster oven, half of the lights, and 90% of the outlets were on one breaker. This caused my computer to shut off randomly, which resulted in immediate loss of whatever I was working on followed by intense rage. Technically, the original plan was to simply ground the upstairs outlets so that my battery backup would not short out the computers, but when your house was built in 1939 there is no such thing as a simple electrical fix. The day involved several trips to the hardware store, 100 feet of Romex, much crawling and poking around the dark dusty areas of the house, plaster dust in the eyes, and extensive use of a hammer. Now my computers are running clean and smooth on their very own breaker, which feels great! I have not lost any work in 5 days now! Oh happy day!! Molly no longer has to announce when she is using the microwave. Wednesday started with a delicious breakfast up at the Mountaineer. After a bit of "real" work in the morning I checked the weather for the day. The forecast called for clear skies so while the ladies cooked up stuff for the Big Meal, Mike and I cooked up ideas to get into the mountains. We settled on a 2 mile hike up Lily Mountain. 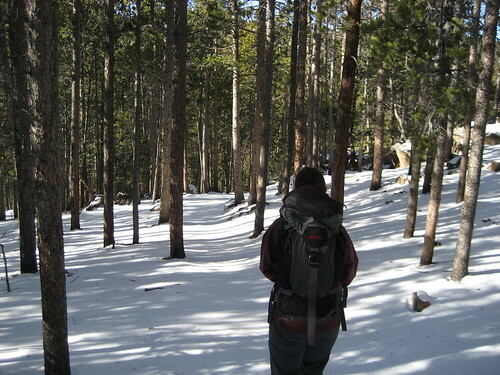 We chose this hike because it was somewhat low in elevation (<10,000 ft) so we wouldn't have to deal with too much snow. 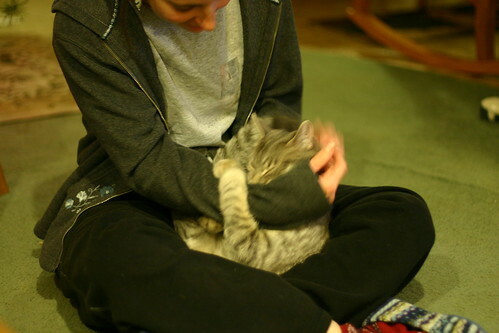 Plus, while Mike loves the altitude, it does not love him back. And the trail head is a convenient 10 minutes from our house. 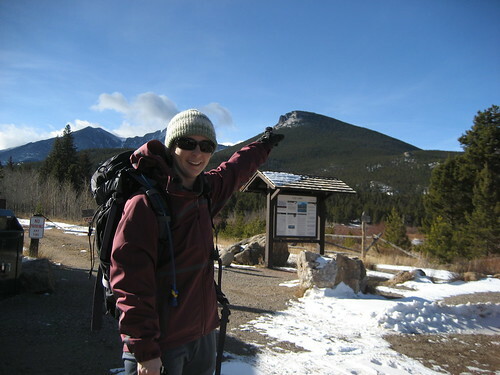 The hike starts from a nondescript pull off near Lily Lake. It is essentially one giant switchback, heading north (and up) for about a mile then switching south (and still up) for the last mile. The first mile is really nice. Evergreen trees everywhere mixed with boulders, cliffs and views. The last mile tends to be thicker trees with less views and steeper climbs, culminating in an outright scramble to a spectacular summit. What a summit! 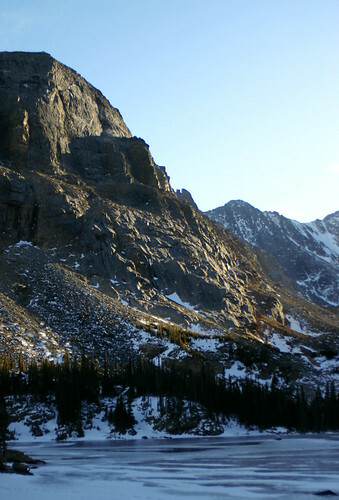 The view to the west is a full panoramic of all the significant summits in Rocky Mountain National Park, starting with Meeker to the south and ending with the Mummy range to the north, all of which were dramatically covered with snow. To the east you could see over the foothills and off into the great eastern plains. And spread out right below your feet was the whole Estes Park valley. Absolutely stunning. However a strong, cold wind kept loitering to a minimum and we were soon descending. As usual, the hike back to the car went much faster and we were soon home, anxiously awaiting the arrival of Joe and fam, who pulled in later that evening. Thursday was a glorious day of gluttony. Lots of delicious food, laughing, and lounging. 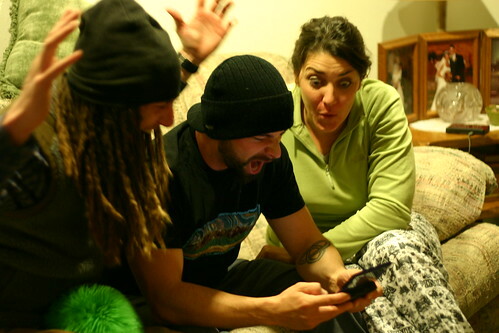 Highlights include the kids beating Kung Fu Panda, eating turkey to Bob Marley (guess who got to pick the dinner music? 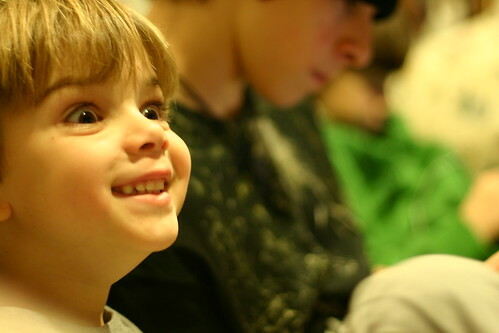 ), laughing at the crazy hair on the dogs in the dog show, Elf, Owen doing a perfect impression of WALL-E's digital voice, charades, a roaring fire, and watching Ironman. Friday was the big shopping day for the ladies so they set off early for the front range, leaving the guys to fend for themselves. We did a tour of Tom's woodshop (our neighbor). Wow, he does incredible work. Joe was feeling a bit under the weather, so Mike and I took the kids up to Lily Lake for a little scrambling. The weather was gorgeous. Isaac and I were down to t-shirts for a bit. 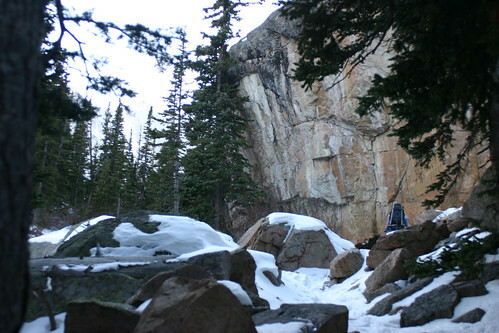 The trail above Lily lake wanders through various boulders offering a multitude of excellent "tennis shoe" bouldering. We found small boulders for Owen to summit and taller boulders for Isaac and I to attack. A good time was had by all. We got back to the house and a nap seemed to have fixed Joe's ailment so we decided to build ourselves a "Bachar ladder". This is essentially a rope ladder with rungs made from 2" PVC tubing. It is hung from something high (a tree in our case) and the bottom tied to something low such that the ladder hangs at an angle (another tree). The idea is to "campus" up and down the rungs only using your arms. Essentially a brutal hand over hand pull-up workout. We were successful and I am still sore. Friday night was the big Estes Park parade. What a great festive event. We all bundled up and walked downtown in the dark. The main street was lit with Christmas lights and lined with people at least four rows deep. Everybody was enjoying the festive spirit and falling snow. It was picturesque: fresh snow, Christmas lights, festive people, steaming coffee, and a parade of elves, police, postmen, pirates (right Kari? ), and floats. The Pirates is kind of an "you had to be there" joke. Molly and I swung into Kind coffee to get a round of steaming lattes and missed the start of the parade. When we did find everyone, the nutcracker float was just going by. Being somewhat excited by the great atmosphere and freshly revved by caffeine, I confused the nutcracker for a pirate, to which I started yelling "Arrrr Matey!!" etc. Saturday started off with the departure of Mike and Gin. They were not sure if they could get back to Iowa in a day and Mike had to be at work on Monday. They got a late start (9am) but make it all the way back home in a respectable 13.5 hours. The weather on Saturday morning was cold and windy with the sun shining once in a while. 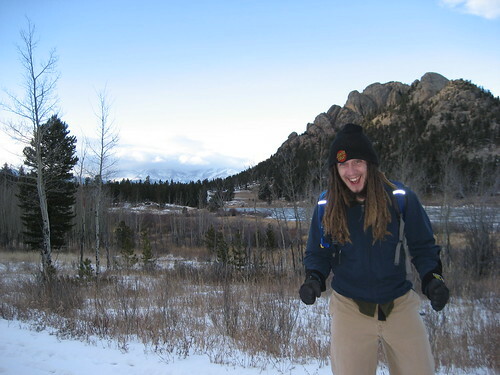 We kicked around several ideas including bouldering (Joe's finger was hurting), snowshoeing (not enough snow), shopping down at the front range (eh....), roped climbing (a little cold) and hiking (yes!). With the current weather and the fact that the boys got out yesterday, Molly volunteered to handle the young-uns in town while Joe, Kari, and I wandered in the mountains. We settled on a plan that would likely involved a lot of my personal favorites; scrambling and bushwhacking. The goal was to start at Lily Lake, meander up towards Jurassic Park, and then run along the ridge to the summit of Lily Mtn. I think at the start of the hike we were all a little concerned about the conditions. 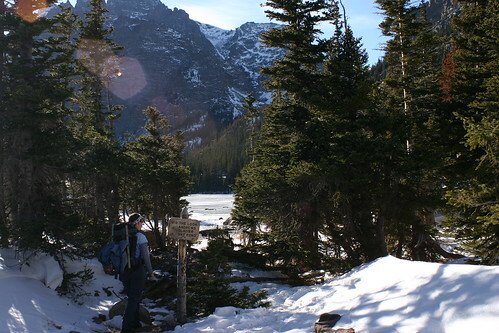 The trail starts next to Lily Lake where icy cold gale force winds were howling. It would come across the lake and whip up all the snow which stung us in the face like needles. Fortunately, the trail quickly climbed off the lake shore and into the trees, where it was much calmer. We managed to stay on the trail for about 10 minutes but by then the lure of the unknown was too much and we were off scrambling up slabs and wandering among the trees. Along the way Joe and I excitedly inspected each boulder we came too, looking for that elusive secret spot of bouldering. I absolutely love being in the mountains and off the beaten path. After much caressing of possible boulders and ogling over various cracks, we made it to the the summit, or at least our summit. Lily Mtn was a little bit further down the ridge but we were happy with where we were. The outstanding views of the mountains that Mike and I enjoyed a few days earlier were unfortunately obscured by low clouds and blowing snow. However the views to the east were still great. As expected the winds were howling on the summit and it didn't take long to get motivated for the descent. We chose a different path back down so that Joe and I could maximize the possibility of stumbling into the next mecca of bouldering. Towards the end, I think Kari had finally had enough of our wandering path to the car because I heard her say "I hike with morons". That night we celebrated with another feast at Ed's Cantina. To say their fries and burgers were enjoyed that night is an understatement. Yesterday after a great conference call with a client Molly and I decided to celebrate with a quick afternoon hike up to the Loch in RMNP. The weather here has been pretty fantastic. Yesterday it was sunny, calm and in the low 60's. Perfect weather for a little hike. We busted out after lunch and left the TH around 12:45. 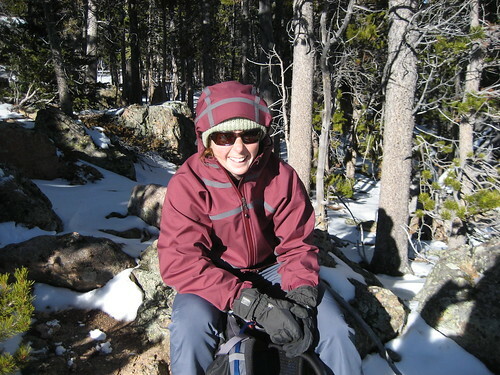 We didn't know what the trail would be like so we packed our ice axes and crampons. I was secretly hoping to find a nice snow gully to climb but it did not come to pass. 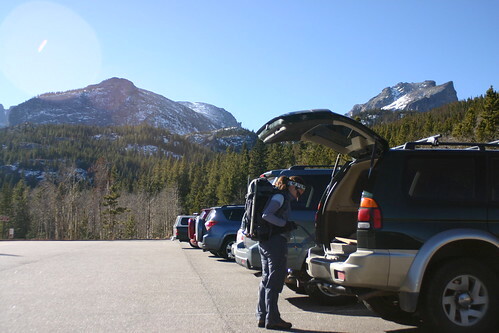 Here is a shot of Molly gearing up at the Glacier Gorge TH. It was strange to see this lot so empty on a nice afternoon. To get a spot here during the summer you either have to be lucky or early. The trail was about 80% snow covered. Unfortunately, the snow was hard packed and slick, making progress somewhat slow. This was also my first hike of the season in actual boots. I have been wearing my Inov8 trail running shoes almost exclusively while hiking. But because of the possibility of deep snow and/or strapping on crampons we had to switch to heavy stiff boots. Oh how my feet longed for the soft comfort of my tennies! We quickly passed Albera Falls, which was nearly completely frozen and silent, and made it to the Loch by about 2:30. I think we only met 5 other people out there. We walked down to the far end of the Loch and shot some pics. We considered hiking up to Andrews Glacier but ended up heading down because it was getting close to our turn-around time of 3. Here are some shots around the Loch. The hike out took a little over an hour. By the end my feet were aching and I was tired of slipping on hard snow. Plus the temps were falling. By the time we got to the truck, it was probably in the 30's. Well, my bout with leg cramps seems to have come to a close. I think I have gone about 36 hours with out a cramp now. Hooray! I tried several home brew remedies thanks to the internet and suggestions from friends and family. Most did not seem to have an effect. The strangest came from my own family...sleep with a bar or Zest soap! Unfortunately, we could not find and single packs of Zest up here in the mountains. We could only find them in bulk. Plus it could take 30 days to start working, so I kept my options open. What did seem to work though (besides constant application of a heating pad) was Cod Liver Oil, as suggested by Holly Peterson. Thanks Holly! Now, I must admit, I am still a little skeptical that the Cod Liver oil is what made the cramps go away. It seems more likely that my cramps just ran its course. I also started taking a multi-vitamin, which makes me feel really old. Last time my parents came to visit, they would take a fistful of vitamins with breakfast, which I found amusing. In the past week I went from not taking anything to three horse sized pills every morning. Karma. There are some things in life that are so good, they defy description. Dark chocolate on a windy summit. Tuna and bagels on a three day backpacking trip. A steaming hot shower after skiing all day. Crusty scabs and sore muscles after a good day of climbing. Today I got to savor the sore muscles. Unfortunately, there are no scabs to pick at. 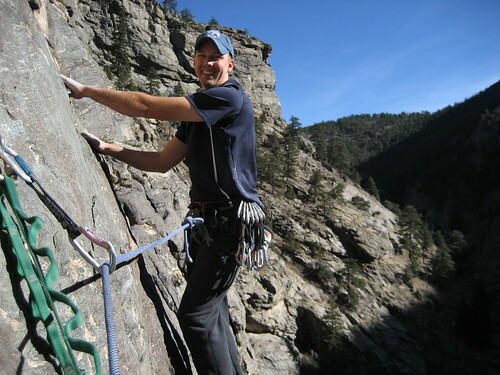 Last week, my old buddy Eric called me up to see if we could climb together over the weekend. Eric and I have been friends since middle school. In fact, he and I started climbing together way back in the day. I am not even sure why we started to climb. We certainly didn't know any climbers. We bought a rope from Farm King, fashioned a swami belt out of old blue jeans, and began exploring the chossy river cliffs of Burlington. 18 years later we are still at it, albeit with a much better rope! 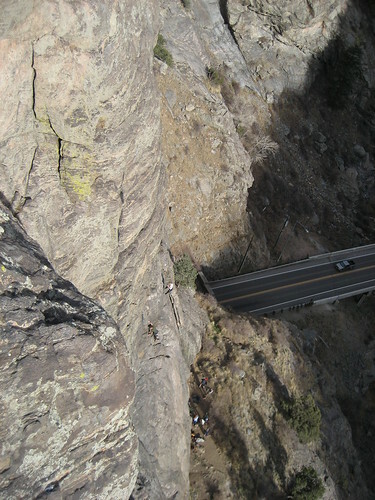 So, after trading a few e-mails, we decided on meeting at Clear Creek Canyon outside of Golden. It was a nice halfway spot for both of us and neither of us had climbed there before. The girls had better things to do so it ended up being a guys day out. I cannot remember the last time just Eric and I went climbing. 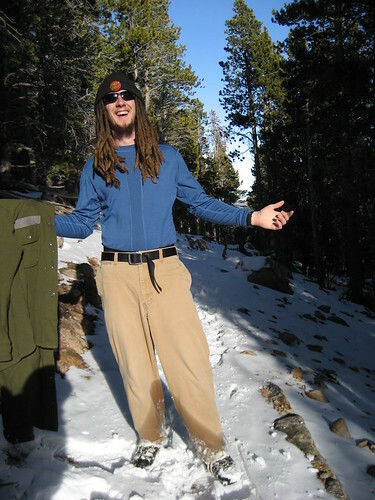 We met in Golden at a local coffee shop, loaded all the stuff into Eric's car and headed into the canyon. The canyon was tight and the rock looked chossy but was actually quite solid. I think it is called schist. Blocky with nice cracks and edges but generally ugly. 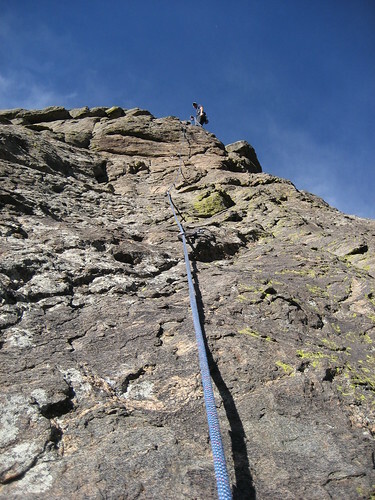 It reminds me of the rock up high in RMNP, like on Notchtop and Hallet. Since our parking spot was only about 6 miles outside of town and it was a warm November weekend, I was surprised to see we were only the 5th car. Still plenty of room! We got to the base of our wall (the High Wire wall) and were surprised to find only one other party there. The sun was still about an hour from hitting the base but it wasn't bad. Probably mid 50's. After a little discussion, we decided to come out swinging and get on a 5.11d (or 5.12a if you check the internet) called Road Kill, which is getting pretty close to my limit of difficulty. 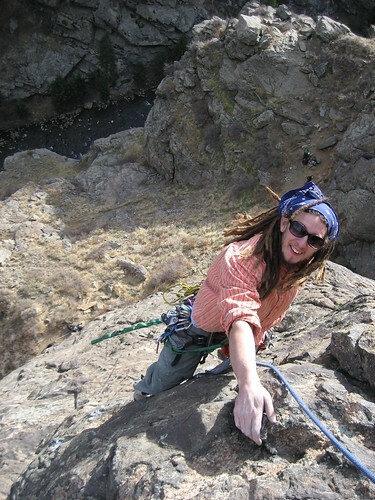 Eric took off and lead a great slab section to a ledge, then up some vertical rock to a pair of anchors below a roof. At this point we were a little confused as to where we were so he clipped the anchors and lowered off. 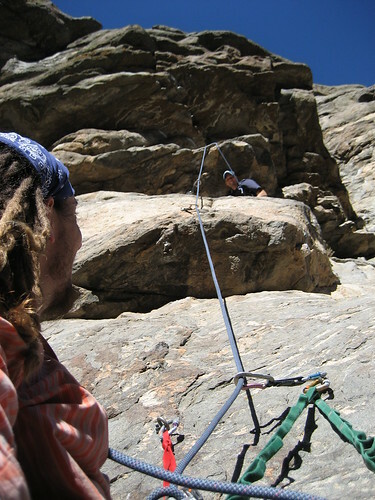 After a little more guide book consultation, we discovered that this route was actually two pitch route. Well, who could pass up a two pitch sport route? So, we pulled the rope down, and I re-lead up to the anchors. Wow, was that lower section hard! It was a little less than vertical but very few holds. As Eric said "if you breath wrong you will fall off". 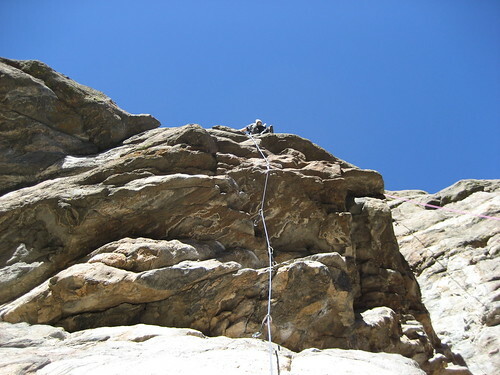 After reaching the two bolt anchor, I rigged a belay and brought Eric up to me. 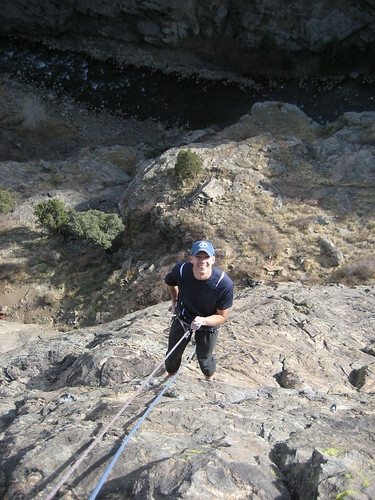 Here is a shot of Eric on the vertical section, below the hanging belay. 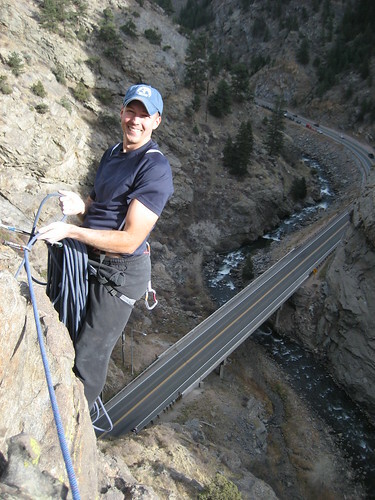 And here he is at the belay, getting ready to head off into the next pitch. And here he is getting psyched for the upper roof. 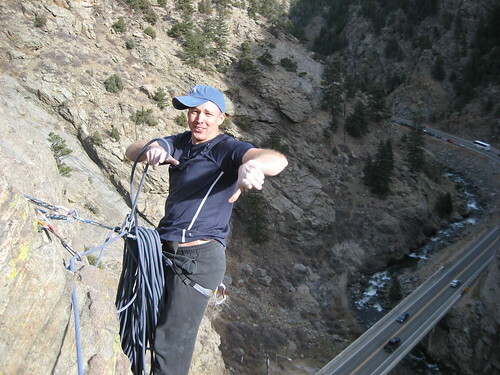 You can also get a good view of my sweet but uncomfortable hanging belay. I am hanging that green and red sling, attached to the bolts. 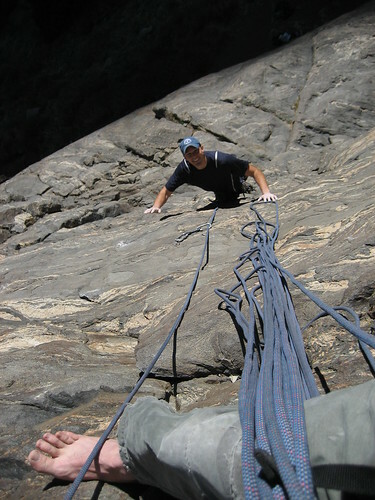 After the roof, Eric clipped into some anchors and I lowered him back to the belay. I was too chicken to lead the roof (plus I was worried that it would be hard to clean) so I did it on top rope, cleaning the draws as I went. 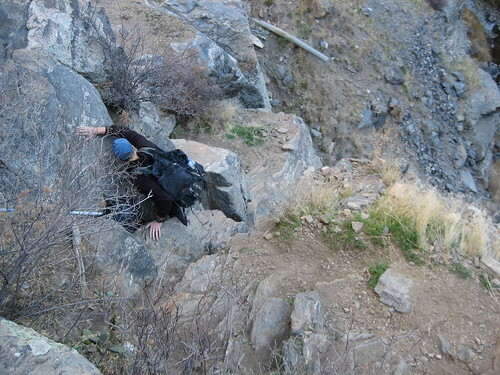 Here is a shot of me getting into the meat of the climb. 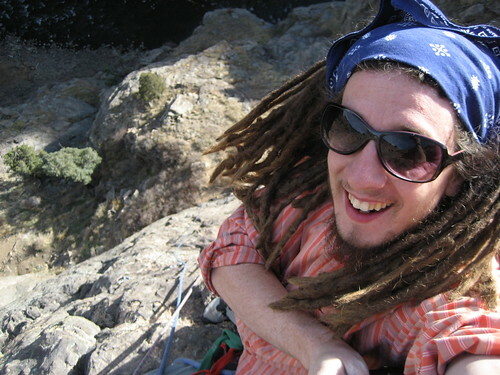 The dreads to a good job of indicating steepness. Here I am after the roof desperately trying to shake out my pumped arms. 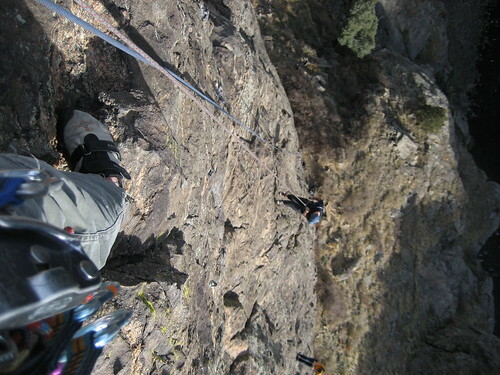 Once I got to the anchors up top, I was able to rappel down to Eric and we both got down to the base. Next we decided to try out Peoples Choice, 5.10d. It was a decent route. Mostly fun easy moves with a section of really hard slab climbing in the middle. Here is a shot of me on the easy part. Next we hopped on Double Deuce. Super sweet route! Very long. I think it was 140' to the anchors and had 17 bolts. Very awesome. 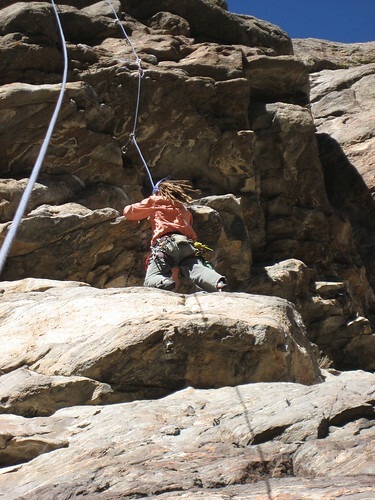 Because it was so long, Eric had to belay me from the top because we didn't have enough rope to lower him to the ground. Here is a shot of Eric way up high. This shot was take well past the halfway point on the route. I tried to get a shot of Eric rappelling with me in the frame but all you can see is my melon. If you look close you can see our backpacks at the base. After that route, we climbed a short steep 10c that was pretty much a one move wonder (Passing Lane, I think) and then capped the day off with a stellar 5.9 called 5th of July. Excellent climb. It was long, had good holds but still made you think a bit. By now it was starting to get dark so we packed up and headed down to the car. Back in town, Eric and I got a quick bite at Ali Babas and then parted ways. It was an excellent day. I will definitely climb there again. 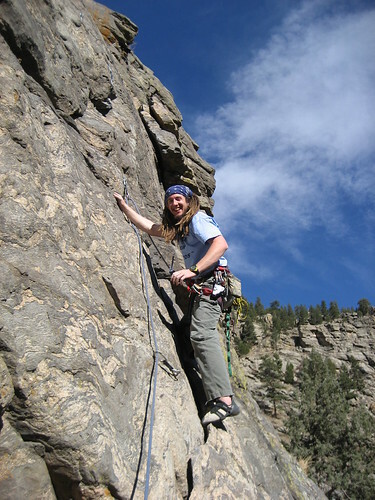 It was also great to climb with Eric again. It always amazes me how deeply friendships are formed when you go climbing with someone. Personally, I have many acquaintances but I can count my true friends on one hand, all of whom I have shared a rope with.